Are you ready for the next big move in Gold? – Technical Traders Ltd. If you were following our research, you would have known that Gold had reached a short-term peak in February. 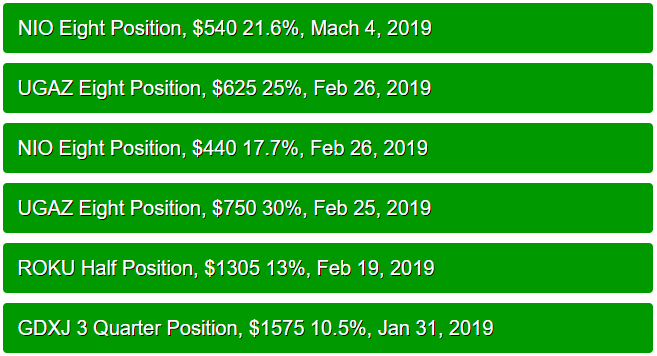 On Feb 19th the day gold posted a huge gain for the day and everyone was bullish and feeling like million bucks I did a radio show with HoweStreet’s Jim Goddard and said that strong day and overly positive sentiment was the going to be the top, which it was – Listen Here. 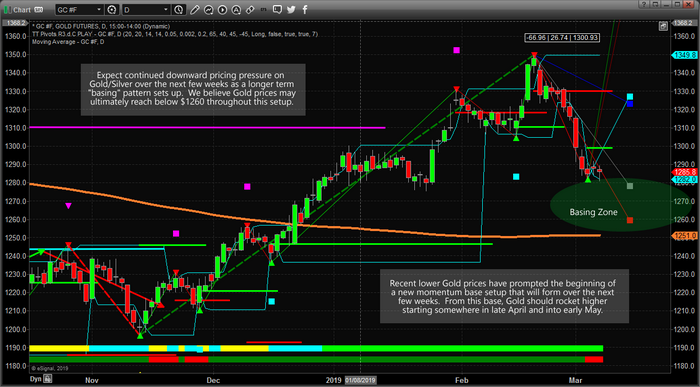 We had been advising our members that Gold would likely retrace below $1300 possibly beeper by and mid-April. Our advanced Adaptive Learning price modeling systems had warned us that Gold would likely setup a price rotation before the next move higher back in January 2019. This is what you need to know about the next 4+ weeks in Gold. First, this downside price move is not over yet. It will likely continue through early April – attempting to establish a price base and new momentum bottom. Our opinion is that $1260 is currently the ultimate low price objective – although this is a soft target. Meaning, the price could retrace below this level (possibly towards $1240) before establishing a true price bottom. Be prepared for a low price near or below $1265 at some point in the near future. Second, this downside price move in Gold will likely create opportunities for skilled traders over the next 3~6+ months. Our longer-term predictive modeling systems suggest that Gold will rally towards $1500 or higher near May/June of 2019. Thus, this downside move in an opportunity for skilled traders. Third, we believe global economic and political news cycles are prompting a shifting capital across the planet at the moment. Global capital is likely shifting into safety in the US Stock market and away from high-flying technology and biotech stocks. Because of this, the fear that would typically drive a rally in Gold has been partially abated. The strength of the US dollar and the willingness of investors to shift capital into larger Blue Chips and Mid-Caps helps to reduce the true “fear hedge” that would drive Gold prices higher. Lastly, we believe this trader psychology will change in late April or early May of this year. Our predictive modeling systems suggest a strong price advance in Gold will take place in May/June of 2019. Our cycle analysis suggested that April 21~24, 2019 are “key dates” for a cycle bottom or some type of news event that could change the dynamics of the precious metals markets. Pay attention. This means that we need to be prepared for the downside price rotation in Gold and be aware that April 21~24 are likely to be a major inflection point in the precious metals markets. Skilled traders would be looking for opportunities before these dates and positioning themselves for the upside move. Our research team, at Technical Traders Ltd., believes the $1260 level is true support – although we believe $1245 or so maybe an ultimate “washout low” price level to watch for. At this time, we are waiting for a clearer basing formation to establish new long positions and we are watching the US Dollar as well. There is still plenty of time for this base/bottom to setup. Remember the April 21~24 date range and plan for key opportunities to setup 7~10 days before this key date. The next move higher in Gold should push prices well above $1400 with a high price target near $1540 for the longer term. If you are a “gold-bug” and/or want to find some real opportunity in the markets, then you won’t want to miss this next move.